The group of Opposition lawmakers, including UPFA MP Wimal Weerawansa, who got stuck in lift number 6 reserved for MPs yesterday, blamed the Government for skipping maintenance and deliberately putting their lives in danger as a part of a conspiracy. The particular lift, which is among the 10 lifts fixed in the Parliament complex in 1981, was used exclusively for lawmakers to reach upper floors. Lift number six has the capacity only to accommodate 13 persons, with a maximum weight of 900kg. However, with 12 lawmakers in the particular lift, it became stuck for over 20 minutes, shutting off the emergency communication with the lift operators until rescued. 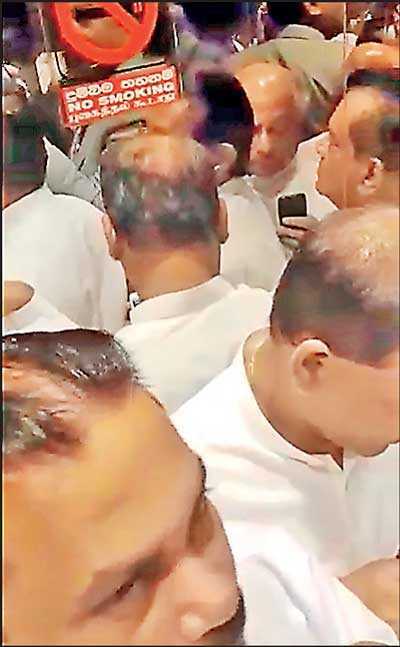 United Peoples Freedom Alliance (UPFA) MP Dinesh Gunawardena, shaken by the mishap, said: “I came to Parliament in 1983, but never had to face such a situation where we were stuck in the lift for 23 minutes. Deputy Minister Ranjith Aluvihare, Chairman of the House Committee who is responsible for such matters, was also in the lift with us. “Would a new elevator be fixed and would it be maintained properly? If not, you should post a notice for those who do not want to risk their lives to use the stairs. We are public representatives and without putting our lives at risk, you should address this issue,” he told Speaker Karu Jayasuriya.